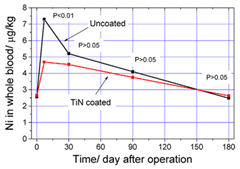 Decrease the dissolution of nickel ion efficiently, expected safe long-term biocompatibility. 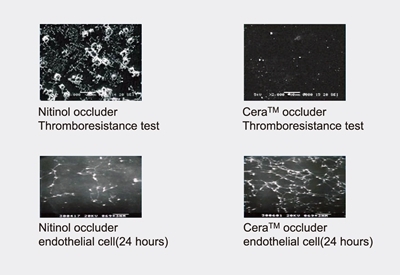 Promote the growth of endothelial tissue, lessen thrombus complication. Superior superelastic, effectively reduce atrioventricular block occurrence. D.Y. Zhang, W.J. Zeng, Z.J. Zi, and P.K. 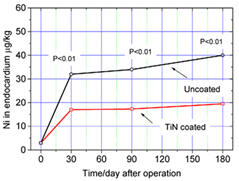 Chu, Fabrication of graded TiN coatings on nitinol occluders and effects on in vivo nickel release, Materials Science and Engineering C. 29 (2009), 1599-1603. 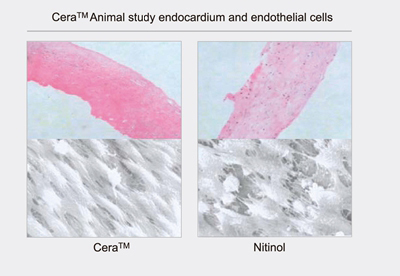 Cera Animal Study: Compared to Nitinol occluder, the Cera occluder have demonstrated that faster and better growth of endothelial cell and lower risk of thrombus formation. The ASD/PFO covered by a PET membrane that minimizes the chance of clot formation and has a small volume to get into lower profile sheath. 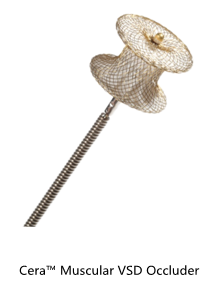 The VSD/PDA occluder covered with a PTFE membrane, which has a denser structure suited for high pressure defect. 3 types of peri-membranous VSD and a muscular VSD devices designed for different kind of VSD. The ASD waist diameter available ranging from 6 to 42 mm, and the PDA occluder ranging from 0406 to 2224. Principal Investigator: Zhang Zhiwei, MD, FACC, Guangdong Cardiac Institute. 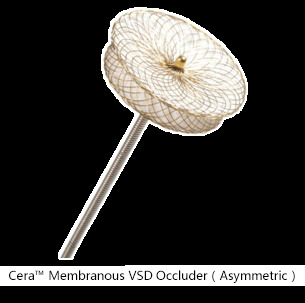 Evaluation of efficacy and safety of Cera™ septal defect occluder for congenital cardiac detect: A multicenter, randomized and controlled clinical trial. - 11 medical centers,460 cases enrolled (231 Cera™, 229 HeartR™). - Follow up endpoint: 1, 3, 6, 12 months. 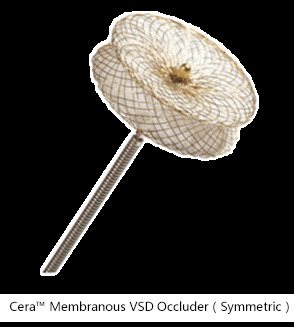 The success rate of immediate complete occlusion with Cera™ occluder is higher than 97.8%. The results showed that the incidence of residual shunt were relatively less. The arrhythmia incidence in Cera group is lower than that in HeartR group which as much as 36%. Principal Investigator: Doctor Raul Arrieta and tutored by Doctor Carlos Pedra. Prospective, multicenter, non randomized study. 3 Brazilian institutions, 56 patients. Follow up endpoint: 1, 3, 6, 12 and 24 months. 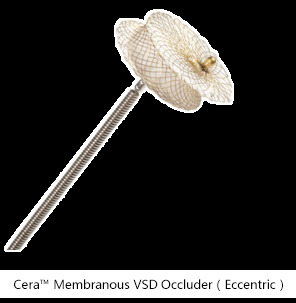 The percutaneous closure of peri-membranous ventricular septal defect with Cera™ Device has showed a safe effect with excellent immediate occlusion and low complication.